It was early and I climbed up to the top deck as we sailed towards Budapest. 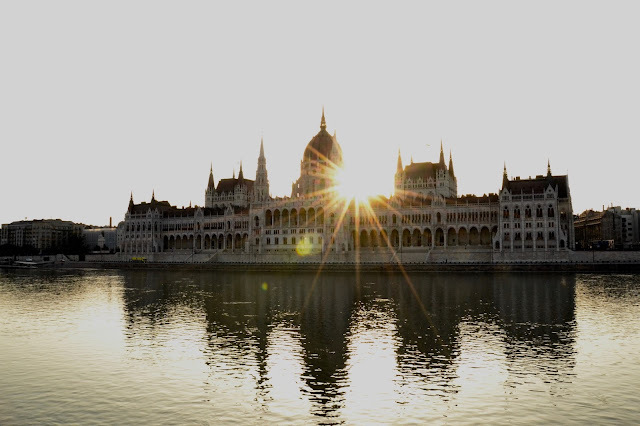 I didn’t want to miss shooting the Budapest Parliament building – you know the one – it’s featured in every TV ad for European River Cruises, and with good reason; it’s gorgeous. We sailed into the city and I wasn’t disappointed but as I stood there, taking photos and chatting, another cruise ship passed going the other way. I estimated 50 passengers on the top deck and they were waving to us, all three of us! 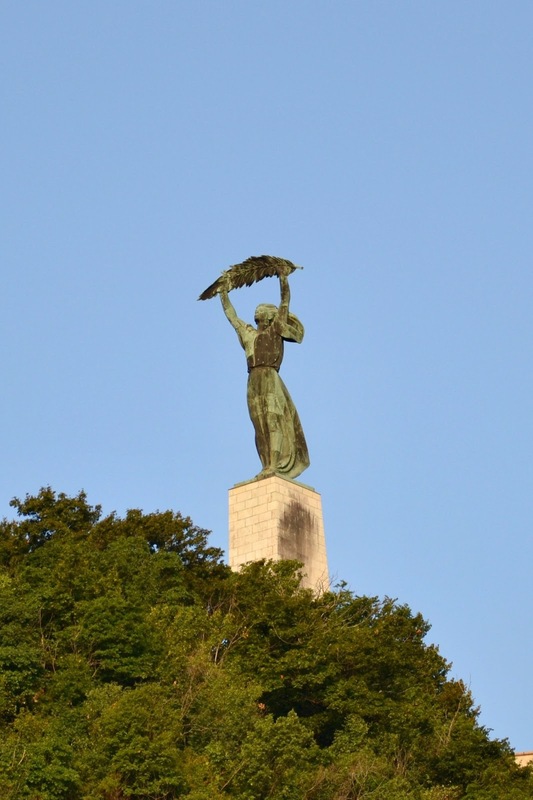 We started high on a hill overlooking the city at the Liberty Statue, a favourite communist icon. She’s the most prominent sight as you cruise through the city. 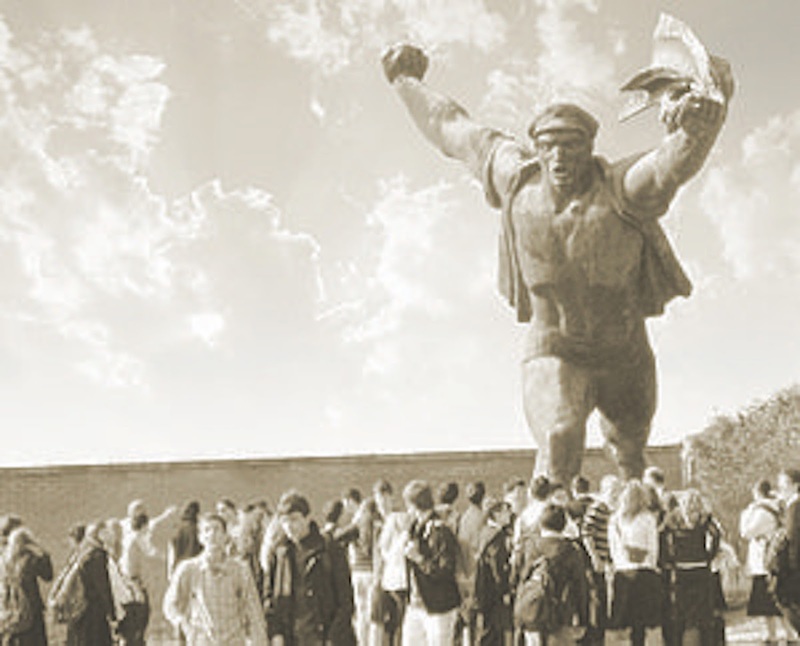 Why is a Soviet era monument still on place? Well, says Nora, we’d grown so used to her we just couldn’t imagine her not there. But, her inscription has changed; the words used to be written in Russian and Hungarian and praise the liberating communist forces, now the text is in Hungarian only, and is an anthem to freedom from oppression. Originally there were two statues at Liberty’s base, one held a hammer and sickle. 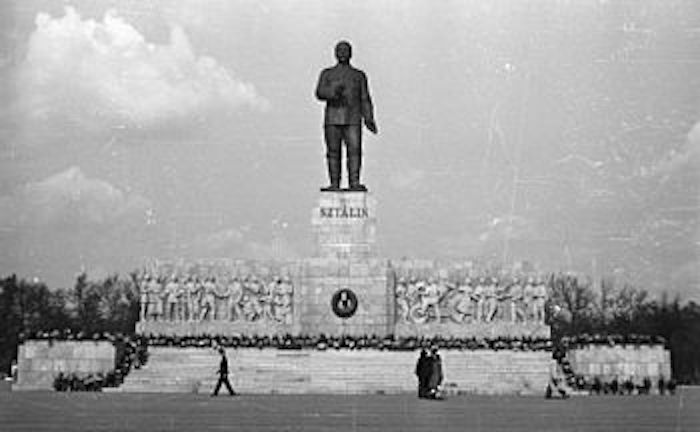 But, he’s been sent to the island of misfit toys (actually, the Communist Era Statues ‘museum’, Memento Park, several miles south of Budapest) – and, he’s got lots of company, the communists loved their statues. 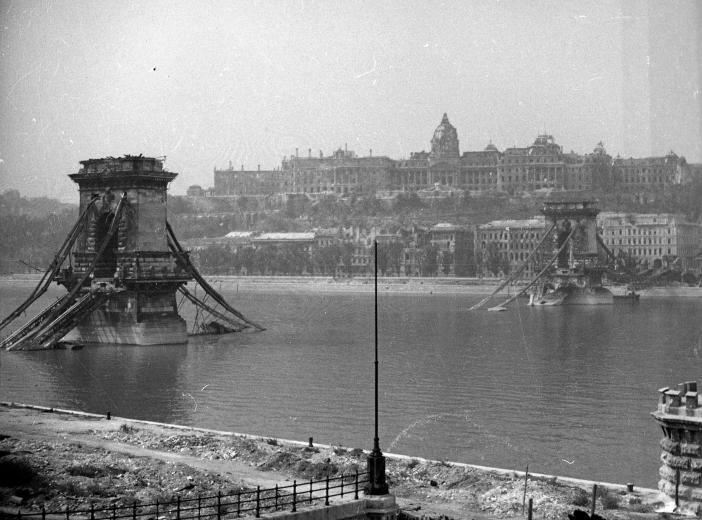 For the city, World War II ended with the 50-day Siege of Budapest. Stalin’s forces surrounded the city and Hitler insisted that the German/Hungarian population trapped inside fight to the last man. Much of the city was destroyed; each one of the bridges was breached or destroyed. As we walked back to the bus, photos showing the destruction of that period were displayed on a wall. We park and walk out into Heroes’ Square. It’s 38°C and the sun threatens to fry the sunscreen oil on our skin. There’s no shade. The colonnade of former leaders looks down on us – the square was built in 1896 to celebrate a thousand years since the seven tribes rode down from the north to form this country. 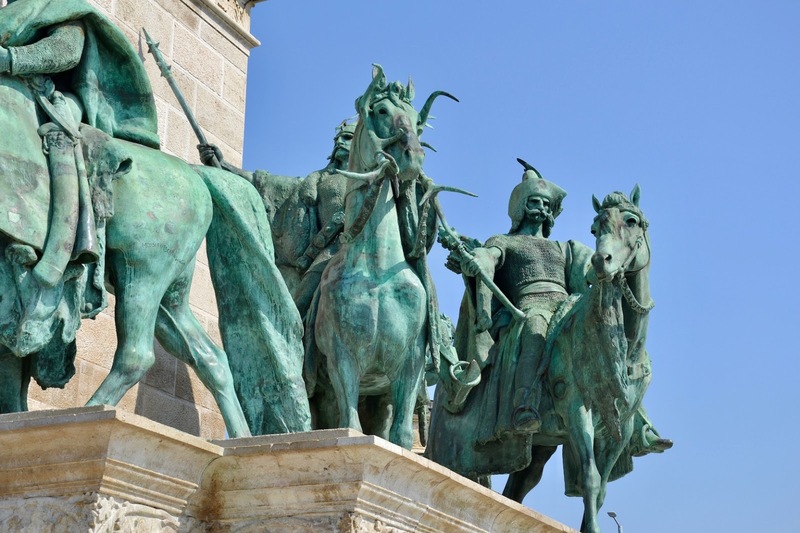 Those seven join Hungary’s beloved King Matthias, among the many depicted here. All, except the Hapsburgs, removed and replaced during the communist regime. From here you can see the old Yugoslav Embassy building where the organizers of the 1956 Uprising were given safe haven… …and were never seen alive again. In secret, their head Imre Nagy was taken, tried, convicted, hanged and buried face down, with his hands and feet bound in barbed wire. In 1989, he was reinterred in a ceremony in this square, attended by more than 250,000 people. We hurry back to our air-conditioned bus. It’s time to return to the cool shade of the boat for lunch. On the way, we pass Boots Square. This square once contained a pretty little church. 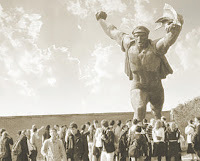 In 1951, the Soviet government tore it down and installed a huge statue of Comrade Stalin, a gift from him, so that he could smile down on all their good work. Less than a 5 years later, during the Uprising, angry crowds tore it down. But, he’d been well planted and they couldn’t topple him, so they cut it through below the knees, leaving only his boots – hence the square’s name. The statue was cut into small pieces – anyone that owns one is very proud of it, Nora tells us. The square now holds a memorial to victims of oppression. There’s a reimagined pair of Stalin’s Boots at Memento Park; but no-one's removing chunks, this time! Wow. Love the Hungarian Parliament building. Great shot and interesting post.